When considering laser eye surgery as an alternative to contact lens wear, one should reflect on a number of issues. In many cases the visual quality that can be obtained with laser surgery can be better than that with contact lenses, especially for patients who have moderate or high amounts of astigmatism. Many contact lens patients have issues with fluctuations in their vision due to movement and rotation of toric contact lenses used to correct astigmatism. At very best, these variations in vision can be frustrating, and, for some people with astigmatism, may make contact lens wear impossible. 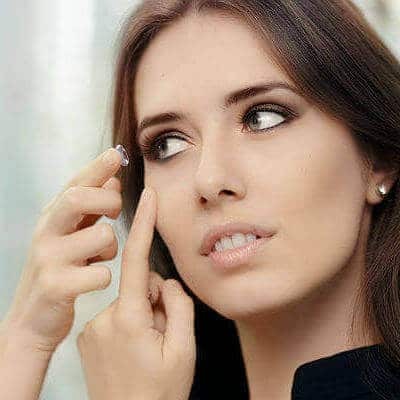 Wearing contact lenses may be more risky than you thought[/caption]Lesser degrees of astigmatism are often left uncorrected with contact lenses due issues with lens comfort and the increased price of toric contact lenses. In contrast, laser eye surgery is designed to treat even very low levels of astigmatism. Most patients with astigmatism will therefore benefit from increased comfort and improved vision following laser eye surgery. Many contact lens wearers may not realise that the risk of eye infection from extended wear of contact lenses may be higher than with laser eye surgery. Over a patient’s lifetime, this significant increased risk of eye infection would suggest that laser eye surgery would be the safer alternative. Contact lens wearers may be aware of the increased risk of infection when wearing lenses in public swimming pools, however not so many are aware of the increased danger to bathers and sports participants when wearing contact lenses in freshwater. Laser eye surgery is worth considering if you wear contacts and lead an active lifestyle based around water based activities such as surfing or water skiing. Eye comfort with contact lenses in many incidences can also be an issue. Many people look at laser eye surgery as a vision correction alternative due to issues with poor comfort and red eyes caused by their contact lenses wear. The added problem of lens insertion and removal and the nuisance of travelling with lenses, cases and solutions are also reasons that make people consider laser surgery as a permanent solution to wearing contact lenses. In addition to the above, issues associated with the wearing of contact lenses, the lifetime costs of lenses, lens solutions and check-up visits makes the benefits of laser vision eye surgery that much more appealing. Interested in Laser Eye Surgery? If you are a contact lens wearer and are considering laser eye surgery, then why not call AVC TODAY on 0800 652 4878 and request your free information pack or book your consultation to find out how we can help you.